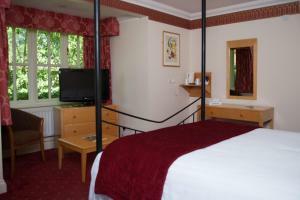 Located in Northgate, Best Western Priory Hotel is a perfect starting point from which to explore Bury Saint Edmunds. The hotel offers a high standard of service and amenities to suit the individual needs of all travelers. Free Wi-Fi in all rooms, 24-hour front desk, facilities for disabled guests, luggage storage, car park are just some of the facilities on offer. All rooms are designed and decorated to make guests feel right at home, and some rooms come with heating, desk, telephone, fan, television. Access to the hotel's golf course (within 3 km), garden will further enhance your satisfying stay. A welcoming atmosphere and excellent service are what you can expect during your stay at Best Western Priory Hotel.